Todays bag is a redux. JCH has featured Alex before as number 24, but he is back, and with a different bag. Lets see how things have changed. My name is Alex Coghe, an Italian Street Photographer currently based on Mexico City. I am photoeditor for Hyde Park Photography magazine, and i am giving Street Photography workshops in italian, english and spanish, also through skype. When I do street photography require compactness, portability and inconspicuous. So for my photowalks in the streets of Mexico I used to go light. 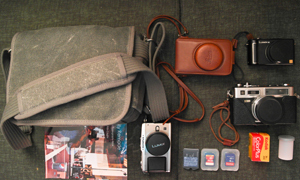 Retrospective 5 by Think Tank Photo is perfect for me: no visible brand and a vintage look, you don’t think there are cameras inside. 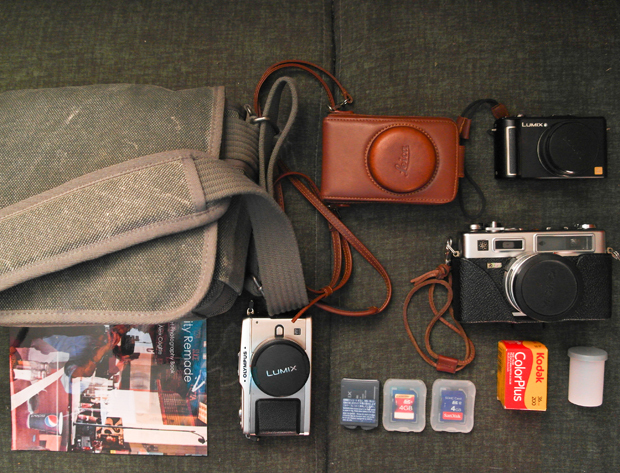 – Panasonic Lumix LX3: I have it for three years now. Still a great point & shot. – Leica Leather Case: for the LX3. Probably the most fashionable object of my gear. 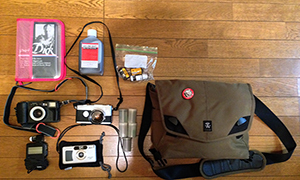 – Yashica Electro 35 GSN: i love this rangefinder. Aperture priority system, good sensations in the hand. – Reality Remade: my project book, something to show people if I stop talking to them. 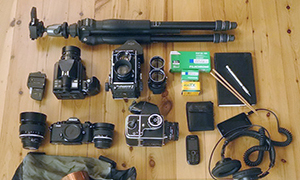 – Olympus E-P1 with Panasonic 14mm f/2.5: for me still a great camera that I know perfectly. Now i am using the pancake of Panasonic because i think is a great lens, wider than the kit lens of Olympus. 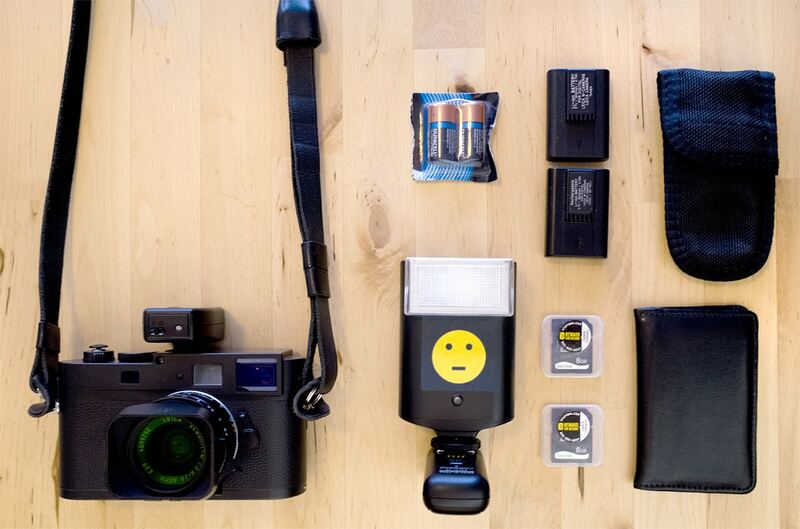 – Spare battery of Lumix LX3: naturally I also carry with me an extra battery for Olympus. – ColorPlus 200: currently i am working to an urban landscape project, so 200 ISO is good! Thanks for sharing another bag with us and thanks for sharing your new site with all of us. Check out Alex’s links and his new site, it is great. Alessio Coghe will be giving a “Street Photography” Workshop soon in Mexico City.